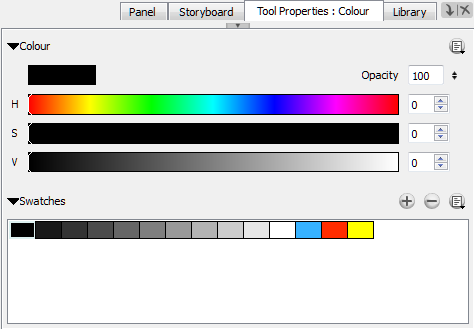 Once you start Storyboard Pro, you can start to draw in the currently selected panel and layer. But first, you must decide on the style of drawing you are trying to achieve, and therefore, the type of layer you will be using: vector or bitmap. Whichever you decide upon, the associated tools become available for that type of layer—see Layers. These are the general steps to start drawing in Storyboard Pro. In the Timeline or Thumbnails view, click a panel. Select a vector or bitmap layer on which to draw—see Layers. In the Tools toolbar, select the Brush tool or press [Alt]+[B]—see Drawing with the Brush Tool . In the Stage view, start drawing. You can change the current colour by adjusting the sliders in the Colour view, or click a swatch to use that colour. To add colour swatches, see Adding a Colour Swatch. Vector layers allow you to create 2D graphics that are made of many individual, scalable objects. Each object is created by a mathematical equation rather than pixels, so they always display at the highest quality. Because they are scalable, vector objects are resolution independent. You can increase and decrease the size of vector objects and your lines remain crisp and sharp, which is ideal for cartoons! On vector layers, the colour is defined for the whole stroke. You can place vector objects on top of other vector objects, but each object will still be able to be manipulated independently. When drawing on a vector layer, you will be using a brush, pencil, or textured brush. Vector brushes produce files that are very light, and are ideal for long projects because you do not have to compromise on efficiency during playback. Also, you can modify the shape of the lines after you draw them using the Contour Editor or Perspective tool. The strokes are stored as separate lines until the drawing is flattened. Textured brushes allow you to create lines that feel more like natural media, like working with a pencil on paper for example. With this kind of stroke, you can still move the strokes around after you draw them. You cannot, use the Contour Editor or Perspective tool on this kind of line. • Advantage: You can get a natural media feel, and still have the ability to modify the position of lines after you draw them. • Disadvantage: File sizes can get heavy. Although some strokes can be flattened, they cannot be flattened when you use different colours. Also, you can only have one colour/shade applied for the entire length of the line. • Recommended Use: For textured drawings in which you can adjust the position of the lines later. 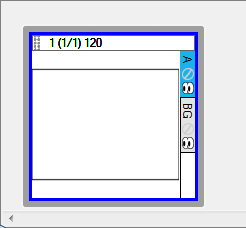 Bitmap layers allow you to create 2D graphics. The bitmap lines you create are made of pixels on a grid that resemble tiny dots, which altogether make up the drawing you are creating or artwork you are importing. Bitmap graphics impart a more natural and soft look to your work. The colour is defined on a pixel-by-pixel basis. Drawing on a bitmap layer allows you to draw in a similar way to how you would in a bitmap tool like Photoshop or Painter. Although you cannot modify the position of the lines after you draw them, you can draw and erase. Instead of drawing lines, you are laying down the individual pixels. This gives you finer control over the brush itself, as well as the shading and colour of the drawing. However, the strokes cannot be edited with the Contour Editor or Perspective tool. It is more efficient for storing texture information than a textured brush on a vector layer, so if you are creating drawings with a lot of texture, this may be a better option. • Advantage: File sizes are not as heavy as when you use textured brushes on a vector layer, since each stroke does not have to be remembered individually. Also, you have full artistic control over the style of the drawing. • Disadvantage: You cannot modify the lines after you draw them. Simply draw and erase, like you would on paper. Also, it can be difficult to reuse the drawing at multiple distances. • Recommended Use: When creating drawings with a lot of texture, for a natural media feel. Particularly when you want a wide variety in colour and shading, this is where you will see the real advantage.